So many delectable delights and so little tummy space! We had to settle for 4 of their seasonal items (春の季). They are afterall only available during this time of the year! 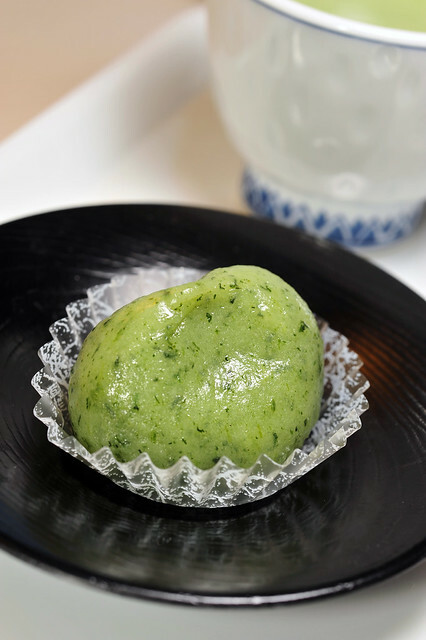 Kusa mochi 草餅（くさもち）traditionally made from Japanese mugwort, which is very very similar to 艾草 in Taiwan. The confection is unique, with a distinct saltiness to it, not to mention a rather “grassy” bitter aftertaste. But this is very elegantly counterbalanced by the anko filling within. The latter is not overtly sweet. Just nice to give a very smooth edge to the overall tasting experience. 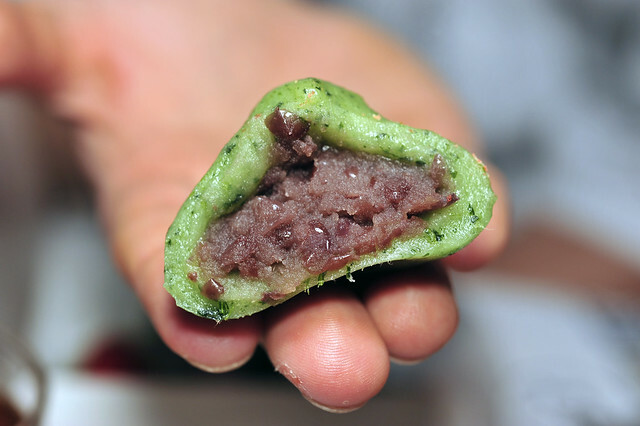 Anko, sweetened azuki bean paste with bits of whole beans for good texture contrast. 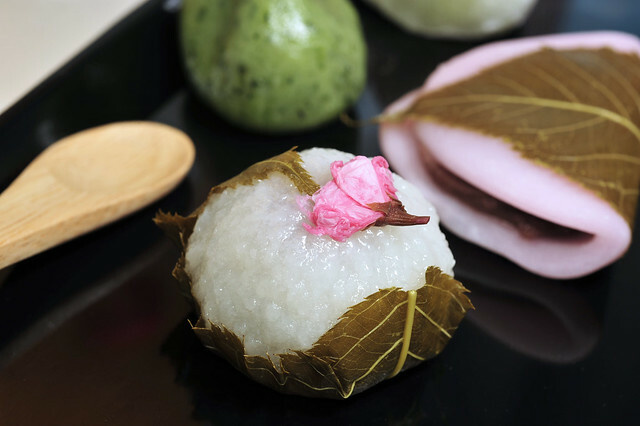 Sakura mochi 道明寺桜餅 using dōmyōji-ko 道明寺粉, glutinous rice flour, a Kansai variation of the seasonal Japanese sweet only available during this time of the year to usher in the coming of spring. Ironically, the pickled sakura flower on top came from the previous year’s blooms. Very beautiful, almost too beautiful to be eaten. 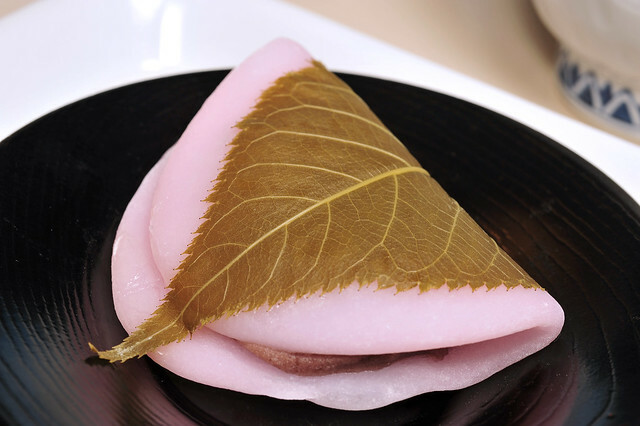 But we had it whole, yes, sakura leaves, flower and all… But the glutinous rice flour gave the dessert quite a bit of heft, filling our stomachs very quickly. That kinda greyed the otherwise very “pink” tasting experience. 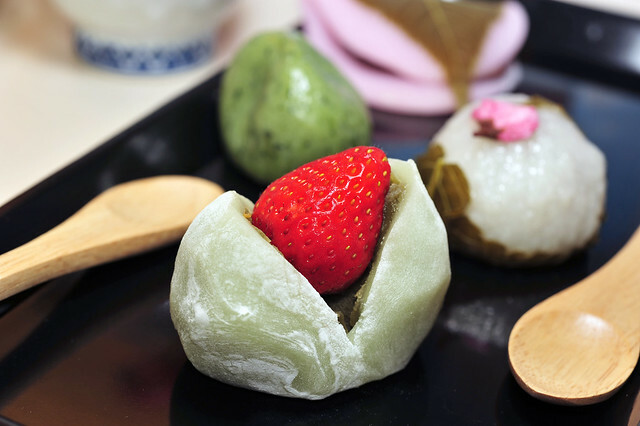 This is my personal favorite, also sakura mochi but the Kanto variation, which uses shiratama-ko 白玉粉 instead. 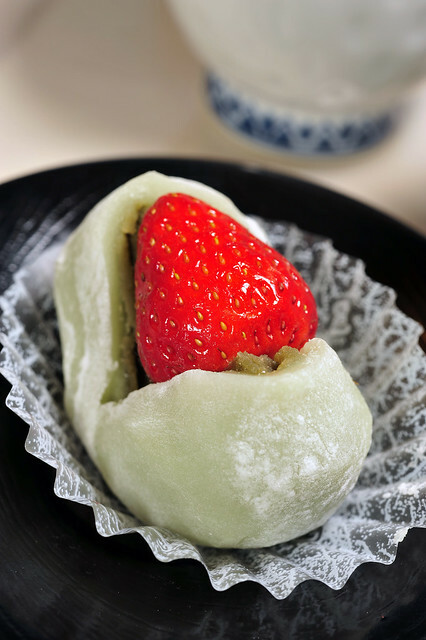 The pastry is lightly flavoured with sakura essence making it more aromatic than the Kansai counterpart. 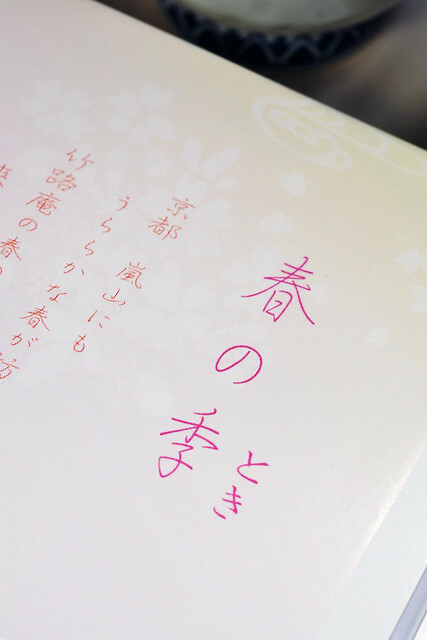 The blushing shade of pink evokes one’s imagination of a tree full of sakura blossoms during Hanami. Kire-ne…. 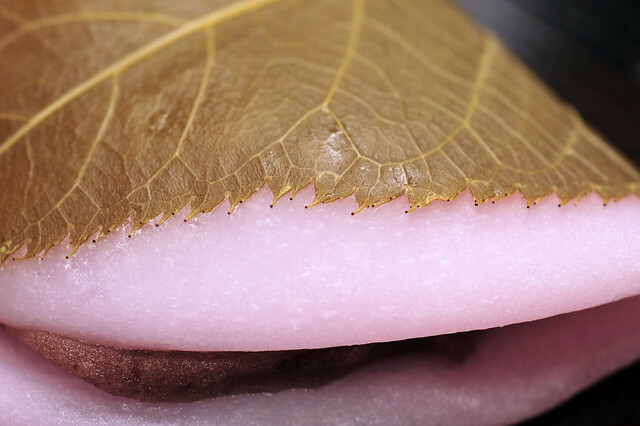 Zooming in on the sakura leaf wrapped around the pastry. 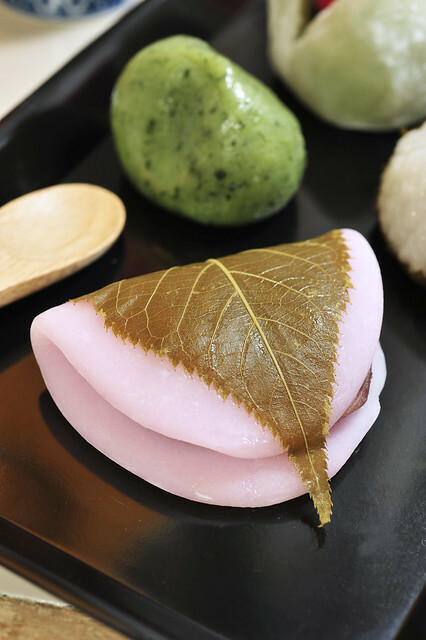 The saltiness of the pickled leaf tames the sweetness from the anko filling, preventing it from overpowering the overall flavours. Overall the experience was absolutely enthralling. 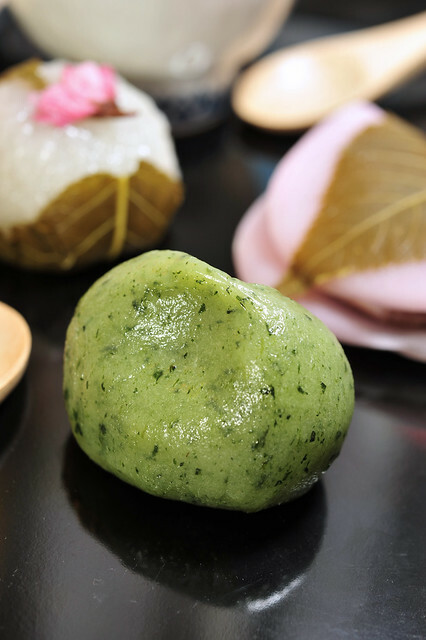 I had imagined wagashi to be simple and somewhat, uninteresting, compared to western dessert making. Afterall the ingredient list is rather short and recurring for many desserts. But I was mistaken; the flavours can be so similar but yet subtly different with so much depth. This entry was posted on April 21, 2011 by Alan (travellingfoodies). It was filed under Food, Travel and was tagged with arashiyama, イチゴ大福, 白玉粉, 竹路庵, daifuku, dōmyōji-ko, 道明寺, 花桜餅, 草餅, Japan, kansai, kix, kusa mochi, osaka, sakura mochi, shiratama-ko, wagashi, 和菓子, 大福, 大阪, 岚山, 日本. haha yeah, slurp indeed, Cathy! hi Janine! everything looks so yummy indeed! but they are so expensive at the same time. Around 150 Yen a pop, that’s more than 2 SGD for one! Loving your Japan series. A holiday there will be my dream come true. Looking forward to the next post! Hi Pick Yin! A holiday to Japan is my dream come true as well! Loving your Hong Kong posts too! Looks like you are enjoying yourself even while on work! very exquisite looking especially the one with sakura leaves! pretty pink too! Are you able to get these in japanese rest in singapore? Hi Lena! they taste very exquisite too! 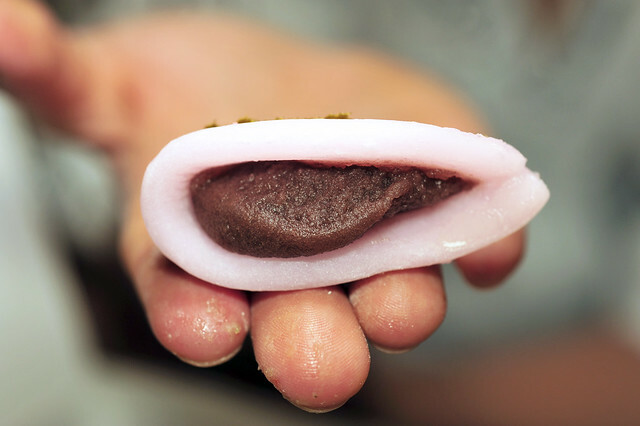 I’m not sure if wagashi is sold in singapore. probably seasonal with food fairs organised by Isetan or Meidi-Ya supermarkets. I bought some ingredients back from Japan though. hope to be able to replicate them!